The Driver Account allows drivers to accept and manage jobs sent from the dispatch. 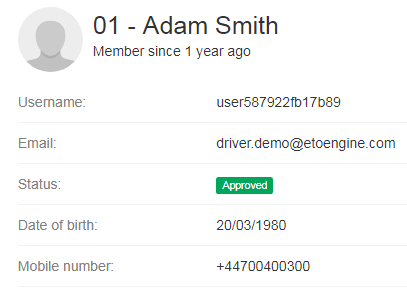 For a driver to start using the Driver Account, an admin has to first create an account for drivers and then send them the access details. How to assign a vehicle to a driver, check HERE. 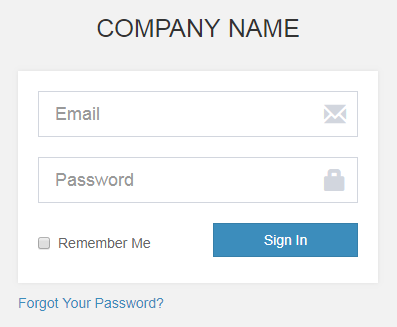 The driver can login to the account with individual access details provided by admin (email, password). 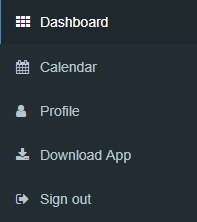 The account menu consists of the following options: Dashboard, Calendar, Profile, Download App and Sign out. If the company is using the Driver App, a driver can download it directly from his account using the Download App button. Read more about the Driver App HERE. This section consist of six tabs: In progress, Awaiting approval, Accepted, Completed, Canceled – which display all the jobs a driver can complete, must complete and has already completed. After entering a chosen reservations tab (Awaiting approval, Accepted, Completed, Canceled) driver will be able to choose from a multitude of actions from the menu. Column visibility (eye symbol) – the driver can customize the account panel by switching columns on/off to create the most suitable setting for his or hers style of work. With a single click a column can be added or taken out of view. Drivers decide which ones they want or need to activate at a given time. Active columns are highlighted with blue and the inactive ones are grey. Refresh – the driver can refresh the system at any moment with the third symbol. The driver panel does however have an automatic,15 second refresh mechanism anyway. Details – the driver can check the journey details here. All bookings details are divided into groups which drivers see in the panel as columns. There are many available options to help drivers make customize their working space. They can adapt and alter the columns order in any way you see fit. All available columns that can be added by drivers to their main view are listed in the Column Visibility. There is a wide variety of alternatives for the drivers to choose from. All new settings will be saved in the browser. Drivers can order the added columns in any way they like by clicking on the title of a column, holding it and dragging it slowly in the direction they want it to move to. After letting go, the new position for that column will be saved in the browser’s memory.